(1) Availability Of Limited Service: Service is generally available to satellite terminals equipped for this service when within the satellite footprint. Service is furnished to YOU or YOUR authorized user. A telephone number may not appear in more than one terminal. YOU agree that YOU have no property right in such number. Apollo reserves the right to assign, designate, or change such number, when, in its sole discretion, such action is reasonably necessary in the conduct of its business. (2) Apollo Service: YOU agree that YOU contracted to have Apollo provide the service and pricing under the terms detailed within this Agreement at Part 7. Apollo reserves the right to change rates at any time. (3) Delivery of Equipment: Apollo agrees to deliver the satellite communication devices and all related equipment at its own risk to the address designated by YOU. Apollo agrees to use reasonable efforts to deliver the satellite communication devices and all related equipment by the requested delivery time but it shall not incur any liability in the event of any delay caused by force majeure or other circumstances beyond its control. YOU agree to accept the satellite communication devices and all related equipment when delivered on or before the delivery time and if for any reason YOU fail to accept the satellite communication devices and all related equipment on or before such date YOU shall nevertheless be liable for the stated rental charge and any applicable cancellation charge. (4) Charges: YOU agree to pay the rental charge from the delivery time until the satellite communication devices and all related equipment in the rental agreement is returned to, accepted, and scanned by the designated courier (UPS or FedEx). In case of office pick-ups, the end of the rental agreement is the day YOU agree to return the satellite communication devices and all related equipment to our office. Rental charges apply to full days and fractions thereof. YOU agree to pay the call charges for all calls made and received on the satellite communication devices after delivery until it is returned to and accepted by Apollo, or received by one of its representatives. Apollo may increase the call charges as and when it deems appropriate. However, Apollo agrees to at all times seek to provide YOU with reasonable notice of any impending change as soon as it becomes practically possible. YOU agree to pay for each incoming, outgoing, completed, incomplete or attempted call in full minute increments, with partial minutes rounded to the next full minute. YOU agree that Apollo charges per length, origin and destination of calls according to statements provided by our telecom supplier; such statements are evidentiary records in case YOU dispute or have any questions about charges. UPON EXHAUSTION OF PREPAID MINUTES, YOU WILL BE CHARGED $2.49 PER MINUTE FOR EVERY MINUTE EXCEEDING THE PREPAID MINUTES YOU INITIALLY PURCHASED WITH THE SATELLITE COMMUNICATION DEVICES RENTAL. YOU AGREE THAT MINUTE OVERAGES ARE BILLED AND DEDUCTED FROM YOUR RENTAL DEPOSIT. attempt to dispose of the satellite communication devices and all related equipment or grant any interest in satellite communication devices and all related equipment to any third party. In the event of any loss, damage, theft or disappearance of the satellite communication devices and all related equipment while on rental, regardless of the circumstances, YOU agree to pay Apollo on demand, an amount equivalent to the value of the satellite communication devices and all related equipment in accordance with Apollo’s then-current-listed satellite communication devices and all related equipment sales prices. In the event the satellite communication devices and all related equipment is stolen or lost, YOU agree that YOU are liable for call charges on such satellite communication devices and all related equipment until it is deactivated by the satellite service carrier. (6) Repairs: If the satellite communication devices and other related equipment is not in working order when YOU receive it or subsequently malfunctions, then YOU agree to notify Apollo immediately. Apollo agrees to repair or replace the satellite communication devices and all related equipment as soon as possible after it has been notified of the problem by YOU and, provided YOU are not in breach of the rental agreement, Apollo agrees to provide YOU with the same or similar satellite communication devices and related equipment as soon as possible for a period equivalent to the part of the rental period unexpired when the malfunction occurred. (7) Data Transmission Use & Dropped Calls: Due to the technical nature of data setups and the inherent sophistication of data transmission through a variety of operating systems, Apollo makes no representation as to the success of data calls through the system. YOU agree that all data call attempts regardless of ultimate successful transmission and termination will be paid for and no credits will be given in the event of dispute of this nature. Along with potential incorrect use (i.e. : next to a building/obstruction), YOU agree that YOU are also responsible for any data transmission at optimum speed, whether intended or not. YOU agree that YOU have been made aware of potential for significant airtime bills and accept this responsibility. All satellite systems have some inherent flaws and anomalies that can create dropped calls of either voice or data nature. Dropped calls will not be credited. Apollo can provide data setup technical support beyond the normal provided setup instructions at an additional charge. Please consult with a sales representative for more details. (8) Changes/Early Terminations/Contractual Limitations: During the contract period, YOU may change YOUR pricing plan to a higher bundle without additional charge. (9) Assignment: This rental agreement cannot be assigned without the written consent of Apollo. (10) Notice of Change/Termination: Notice of change or termination should be made by contacting the Apollo Customer Service Department at +1 (844) 248-0123. Apollo reserves the right to terminate this Contract at any time during the contract period. In the event of a termination or cancellation, YOU will not receive a refund for any unused prepaid minutes or unused rental or service period. (11) Invoicing and Guarantee of Payment of Services: Apollo will invoice YOU. This bill is due and payable upon receipt. Monthly recurring charges are billed monthly in advance. YOU understand that they are responsible for all air time charges, including but not limited to direct airtime, long distance and roaming charges (if applicable), and charges for any Customer-elected, value-added services (when available). Payment must be made in U.S. Dollars. YOU agree that YOU request for direct billing are subject to credit approval and may be subject to required deposits and/or direct payment by credit card or a guarantee authorized against a valid accepted credit card. (12) Taxes: The price of the service does not include sales, usage, excise, ad valorem, property or any other taxes now or hereafter imposed, directly or indirectly, by any governmental authority or agency with respect to the Service. YOU agree that YOU shall pay such taxes directly or reimburse Apollo for any such taxes. (13) Deposits: Satellite communications devices and all related equipment, including mobile satellite services, are granted subject to credit approval by Apollo. Apollo requires the establishment of credit or the ability to pay invoices according to the established terms. Deposits may be required for Non-US citizens or customers who do not have established credit. YOU agree to be advised prior to service activation if a deposit is required. Deposits will be refunded at service or contract termination and all airtime has been paid. (14) Foreign Credit Cards: Foreign credit cards will be accepted only after a complete verification has been done with the issuing bank. The issuing bank must contact the credit card holder and confirm the authorization for the charge to be approved. Verification of foreign credit cards may delay order processing for up to 72 hours. All deposits for terminals will still apply. 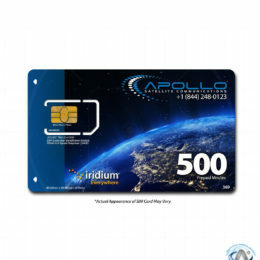 Apollo reserves the right to decline any credit card transaction. (15) Non-Payment / Breach: A late charge of the lesser of 1-1/2% per month will be applied to each of YOUR service bills not paid by the due date. This late charge is applicable to the unpaid balance as of the due date. YOU agree that YOU shall pay Apollo all costs including, without limitation, reasonable attorney fees, the fees of any collection agency, and any other costs incurred by Apollo in exercising any of its rights under the Agreement. Additional deposits may be required after such an event. Apollo charges a fee of $25.00 for returned checks on the first happening and $35.00 for all subsequent returned checks. (16) Limitation of Liability: The satellite services provided by Apollo may be temporarily interrupted, delayed or otherwise limited and is not available everywhere in the world. Apollo makes no representation that it can provide uninterrupted service. Furthermore, Apollo shall have no liabilities or credit due for interrupted service unless caused by the gross negligence of Apollo. Apollo shall not be liable for acts or omissions of other carriers, equipment failures or modifications, acts of God, strikes, government actions, or other causes beyond our reasonable control. APOLLO MAKES NO WARRANTIES WITH RESPECT TO THE SERVICE OF ANY KIND WHATSOEVER, EXPRESSED OR IMPLIED, EXCEPT AS SPECIFICALLY PROVIDED IN THIS AGREEMENT. THE IMPLIED WARRANTIES OF MERCHANTABILITY AND FITNESS FOR ANY PARTICULAR PURPOSE ARE HEREBY DISCLAIMED AND EXCLUDED. APOLLO SHALL NOT BE LIABLE TO ITS DISTRIBUTOR OR YOU/CUSTOMERS OR ANY THIRD PARTY FOR ANY SPECIAL, INCIDENTAL, OR CONSEQUENTIAL DAMAGES. (17) Subscriber Terminals and Equipment: Unless provided otherwise, Apollo is not responsible for the installation, operation, quality of transmission, or maintenance of YOUR equipment. If YOUR equipment is stolen, YOU are responsible for all charges as agreed upon in this Agreement until proper written documentation is received and confirmed by Apollo. (18) Licensing: Customers wishing to operate satellite phones while in foreign territories shall be required to obtain any and all licensing or approvals that may be required to operate within that territory. Apollo does not guarantee any authority to radiate from territories other than those allowing trans-border operations of Inmarsat equipment. For more information on this, please consult with your Apollo Account Manager. (19) Governing Law: This contract is governed by the laws of the State of California and applicable tariffs. (20) Miscellaneous: No waiver by Apollo of any breach of this rental agreement shall be considered as waiver of any subsequent breach of the same or any other provision hereof. Apollo is not liable for any lack of privacy which may be experienced with regard to the services, satellite communication devices and all related equipment. (21) Entire Agreement: This rental agreement constitutes the entire agreement between Apollo and YOU. There are no other representations, conditions, warranties, guarantees, or collateral agreements, express or implied, statutory or otherwise, concerning the use or rental of the satellite communication devices and all related equipment or services other than as set forth herein. (22) YOU/CUSTOMER AGREE THAT ANY LEGAL PROCEEDING COMMENCED BY ONE PARTY AGAINST THE OTHER, SHALL BE BROUGHT IN ANY STATE OR FEDERAL COURT HAVING PROPER JURISDICTION WITHIN THE STATE OF CALIFORNIA. BOTH PARTIES SUBMIT TO SUCH JURISDICTION AND WAIVE ANY OBJECTION TO VENUE AND/OR CLAIM OF INCONVENIENT FORUM.